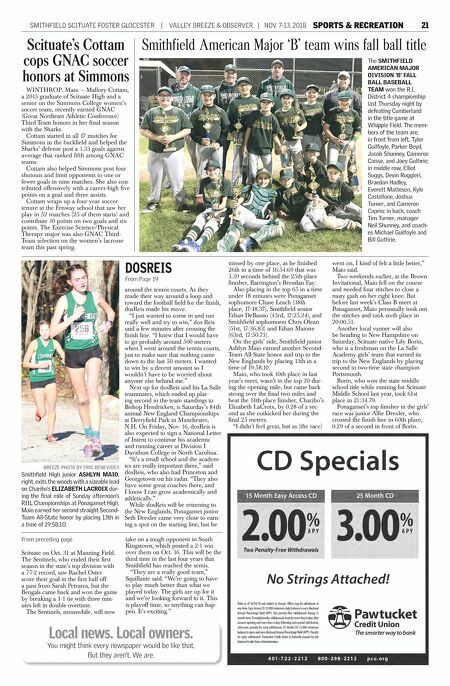 SMITHFIELD SCITUATE FOSTER GLOCESTER | VALLEY BREEZE & OBSERVER | NOV. 7-13, 2018 SPORTS & RECREATION 21 around the tennis courts. As they made their way around a loop and toward the football field for the finish, dosReis made his move. "I just wanted to come in and run really well and try to win," dos Reis said a few minutes after crossing the finish line. "I knew that I would have to go probably around 500 meters when I went around the tennis courts, just to make sure that nothing came down to the last 50 meters. I wanted to win by a decent amount so I wouldn't have to be worried about anyone else behind me." Next up for dosReis and his La Salle teammates, which ended up plac- ing second in the team standings to Bishop Hendricken, is Saturday's 84th annual New England Championships at Derryfield Park in Manchester, N.H. On Friday, Nov. 16, dosReis is also expected to sign a National Letter of Intent to continue his academic and running career at Division I Davidson College in North Carolina. "It's a small school and the academ- ics are really important there," said dosReis, who also had Princeton and Georgetown on his radar. "They also have some great coaches there, and I know I can grow academically and athletically." While dosReis will be returning to the New Englands, Ponaganset junior Seth Drexler came very close to earn- ing a spot on the starting line, but he missed by one place, as he finished 26th in a time of 16:54.60 that was 3.39 seconds behind the 25th-place finisher, Barrington's Brendan Fay. Also placing in the top 65 in a time under 18 minutes were Ponaganset sophomore Chase Leach (38th place, 17:18.37), Smithfield senior Ethan DeBassio (43rd, 17:25.24), and Smithfield sophomores Chris Olean (51st, 17:36.83) and Ethan Maione (63rd, 17:50.73). On the girls' side, Smithfield junior Ashlyn Maio earned another Second- Team All-State honor and trip to the New Englands by placing 13th in a time of 19:58.10. Maio, who took 10th place in last year's meet, wasn't in the top 20 dur- ing the opening mile, but came back strong over the final two miles and beat the 14th-place finisher, Chariho's Elizabeth LaCroix, by 0.28 of a sec- ond as she outkicked her during the final 25 meters. "I didn't feel great, but as (the race) went on, I kind of felt a little better," Maio said. Two weekends earlier, at the Brown Invitational, Maio fell on the course and needed four stitches to close a nasty gash on her right knee. But before last week's Class B meet at Ponaganset, Maio personally took out the stitches and took sixth place in 20:00.51. Another local runner will also be heading to New Hampshire on Saturday, Scituate native Lily Borin, who is a freshman on the La Salle Academy girls' team that earned its trip to the New Englands by placing second to two-time state champion Portsmouth. Borin, who won the state middle school title while running for Scituate Middle School last year, took 61st place in 21:34.79. Ponaganset's top finisher in the girls' race was junior Allie Drexler, who crossed the finish line in 60th place, 0.29 of a second in front of Borin. Scituate on Oct. 31 at Manning Field. The Sentinels, who ended their first season in the state's top division with a 7-7-2 record, saw Rachel Oster score their goal in the first half off a pass from Sarah Petrarca, but the Bengals came back and won the game by breaking a 1-1 tie with three min- utes left in double overtime. The Sentinels, meanwhile, will now take on a tough opponent in South Kingstown, which posted a 2-1 win over them on Oct. 16. This will be the third time in the last four years that Smithfield has reached the semis. "They are a really good team," Squillante said. "We're going to have to play much better than what we played today. The girls are up for it and we're looking forward to it. This is playoff time, so anything can hap- pen. It's exciting." From preceding page DOSREIS From Page 19 BREEZE PHOTO BY ERIC BENEVIDES Smithfield High junior ASHLYN MAIO, right, exits the woods with a sizeable lead on Chariho's ELIZABETH LACROIX dur- ing the final mile of Sunday afternoon's RIIL Championships at Ponaganset High. Maio earned her second straight Second- Team All-State honor by placing 13th in a time of 19:58.10. The SMITHFIELD AMERICAN MAJOR DIVISION 'B' FALL BALL BASEBALL TEAM won the R.I. District 4 championship last Thursday night by defeating Cumberland in the title game at Whipple Field. The mem- bers of the team are, in front from left, Tyler Guilfoyle, Parker Boyd, Jacob Shunney, Cameron Caisse, and Joey Guthrie; in middle row, Elliot Suggs, Devin Ruggieri, Braedan Hadley, Everett Matteson, Kyle Castellone, Joshua Turner, and Cameron Caprio; in back, coach Tim Turner, manager Neil Shunney, and coach- es Michael Guilfoyle and Bill Guthrie. Smithfield American Major 'B' team wins fall ball title Scituate's Cottam cops GNAC soccer honors at Simmons WINTHROP, Mass. 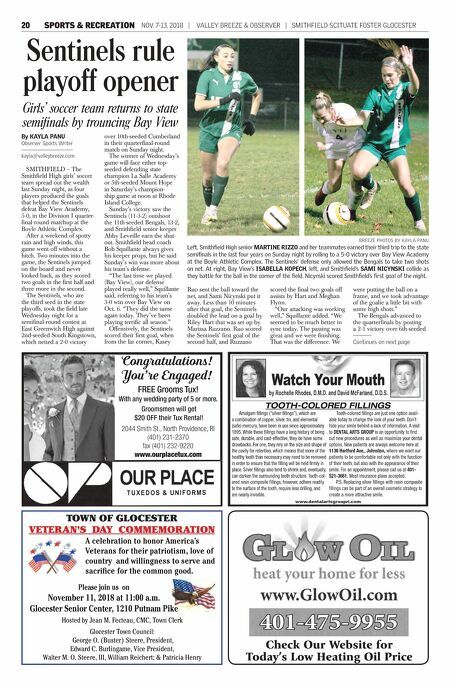 – Mallory Cottam, a 2015 graduate of Scituate High and a senior on the Simmons College women's soccer team, recently earned GNAC (Great Northeast Athletic Conference) Third-Team honors in her final season with the Sharks. Cottam started in all 17 matches for Simmons in the backfield and helped the Sharks' defense post a 1.33 goals against average that ranked fifth among GNAC teams. Cottam also helped Simmons post four shutouts and limit opponents to one or fewer goals in nine matches. She also con- tributed offensively with a career-high five points on a goal and three assists. Cottam wraps up a four-year soccer tenure at the Fenway school that saw her play in 52 matches (25 of them starts) and contribute 10 points on two goals and six points. The Exercise Science/Physical Therapy major was also GNAC Third- Team selection on the women's lacrosse team this past spring. Local news. Local owners. You might think every newspaper would be like that. But they aren't. We are.